1. Preheat oven to 180C Fan Forced. Line a baking tray with baking paper. 2. Peel sweet potato and cut into 3 cm chunks. Spread onto baking tray and drizzle with around 1 tsp olive oil and season very well with S&P. Bake in the oven for 20 minutes or until tender and golden. Remove and set aside. 3. Meanwhile bring a large saucepan of water to the boil. Add a big pinch of salt and then cook 1-2 lasagna sheets, for a few minutes, until just tender. Remove and place into a bowl of cold water. Repeat with remaining sheets. 4. In a shallow oven proof dish, combine the tomatoes, oregano, garlic, onion and sugar. Season well with S&P. Stir in ½ cup water. Spread evenly across the bottom of the dish. 5. Place the roasted sweet potato pieces into a mixing bowl and mash roughly. Mix in the ricotta, nutmeg, lemon zest and basil leaves. Season with a good pinch of S&P. Add ¼ cup of the parmesan and combine. 6. Lay a lasagna sheet onto a clean bench. Spread the sheet gently with some of the sweet potato filling so it is around 1.5cm thick. Roll up from the short side to create a spiral roll. Gently cut the roll in half and stand up the pieces in the sauce in the baking dish. 7. 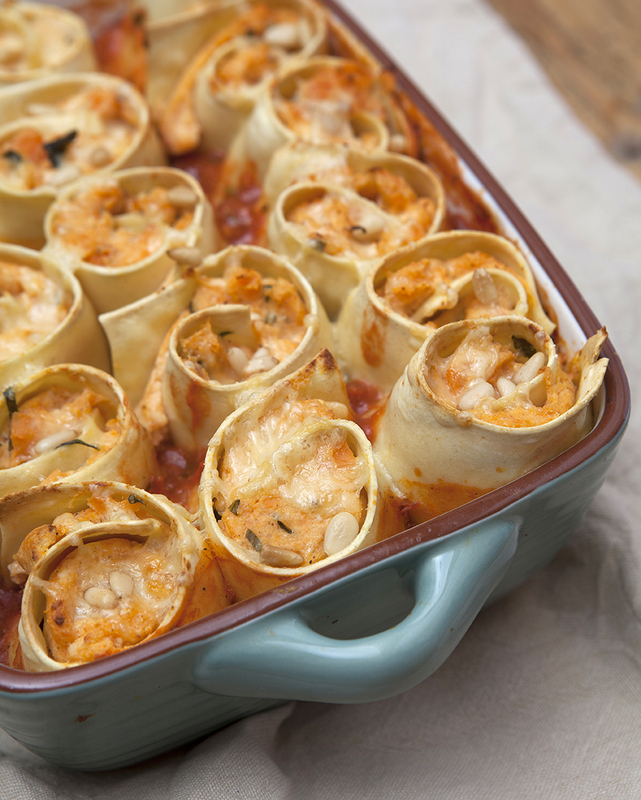 Repeat with remaining lasagna and filling, arranging the pasta rolls in the dish evenly. 8. Cover the top with some foil and bake for 30 minutes in the centre of the oven. 9. After 30 minutes remove the foil and sprinkle the top with the remaining ¼ cup of parmesan cheese and the pine nuts. Return to the oven and cook for a further 15-20 minutes. 10. Remove from the oven and rest for 10 minutes before serving. *This is a great “make ahead” dish that can be prepared and covered with cling film at the end of Step 7 and refrigerated for up to 3 days. To finish remove the cling film and cook following Step 8 onwards.